We set another record yesterday. This one has me scratching my head. The Brent WTI spread widened to $27.22. That’s never been seen before. There are some partial explanations for this phenomenon. Brent is lighter in grade and justifies a somewhat higher price. But not $25. Another consideration is the increasing flow of crude from the Bakken field in North Dakota. This crude often heads to Cushing, Oklahoma, and therefore creates a supply glut. The WTI price should be lower than Brent based on this. But, one again, $25 seems out of whack. The smart guys up in NDAK are also sending crude by trains to the Gulf area where prices are higher. Another consideration is that WTI is a hedging mechanism for algo computers. When there is announced evidence of a slowing economy the markets all react. If economic activity is in decline it makes “sense” that crude should trade lower. Computers that are trying to move risk around buy bonds and sell crude. The WTI contract is the place for this type of market force to be settled. So which price is right for crude? 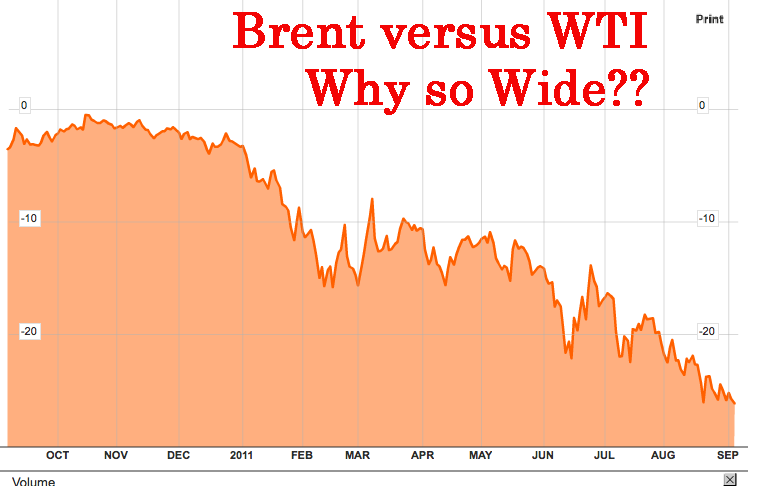 Is it Brent or is it WTI? The answer, to me, is that Brent is the benchmark to look at. WTI (and the futures pricing behind it) has little to do with the cost of petroleum in the US. Consider this chart of LLS crude. This is the pricing for ‘sweet’ crude for cash delivery at the Gulf of Mexico. What is very clear is that the cost of crude used by US refiners to produce gasoline has nothing to do with the WTI price. LLS pricing has been running a $3-4 premium over Brent for some time now. That, to me, makes perfect sense. A shipment of Nigerian crude (sweet) has two destinations. One is Rotterdam, the other is the GOM (Louisiana offshore delivery). The shipping cost for GOM delivery of a VLCC (1mm barrels of crude) is about $4/Brl higher than for European delivery (4-6 extra days of transit). Therefore a pricing matrix where LLS is equal to Brent +$4 is consistent. The price of gasoline for much of the country is driven by crude pricing in the Gulf; not Cushing, Oklahoma. At yesterdays closing price for LLS the price of gas is going higher in the USA. So another big drag on the economy is in front of us. A few months back the smart folks at the Department of Energy tried to influence the LLS pricing by releasing crude from the SPR. That worked, for about a week. The LLS/WTI spread was about $15 at the time. Given that it is much higher today I think it is possible that D.C. will again choose to sell some more of the strategic holdings of crude in an effort to create a cheaper cost for gasoline. If the DOE was in for a penny in June then they should be in for a pound (or two) right now. One can be sure that the interventionists in Washington are teeing this up as I write. I can’t come up with a logical explanation for the huge WTI/LLS pricing differential. With a spread of $27 one could fill up a few hundred-car trains in Oklahoma and ship the excess crude to the Gulf. With the spread as wide as it is, a train full of crude could drive back and forth across the continent a few times before getting to the final destination and still end up cheaper that $27. So what gives? I smell manipulation in this. What it comes down to is that the price of crude that we actually use to make gas has little to do with the price of crude that is traded on the exchanges. Why? We know the US economy is broadly in decline. We know that $4 gas is a factor that will accelerate the downward economic forces. 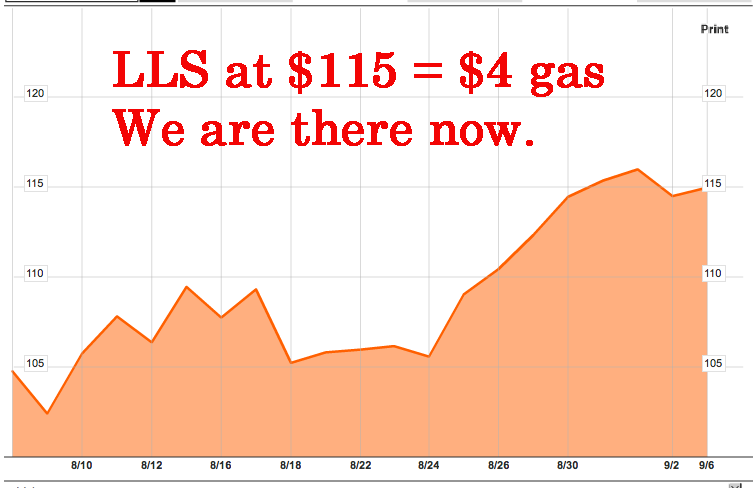 We know that $115 crude (lls/Brent) will translate to $4 gas at the pump. We know that the “deciders” love to intervene to “fix” things that are broken. My conclusion? The DOE will be doing Round II of SPR sales. This will happen in the near future. When that happens some fat cat oil companies will make a bundle (they did last time). But like the SPR sales in June there will be no lasting effect on market prices. Gas is going up in price, and it’s going to stay high. Just another gloomy factor in an already gloomy economy. From Bruce Krasting: Crude on the Wide – Why?.